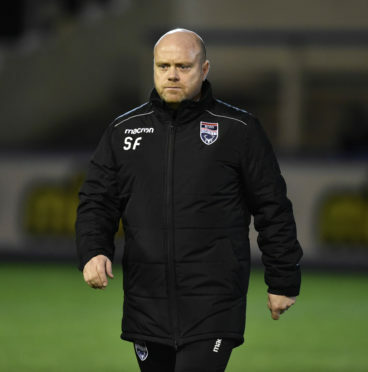 04/01/19 LADBROKES CHAMPIONSHIP MORTON v ROSS COUNTY CAPPIELOW - GREENOCK Ross County co-manager Steven Ferguson. The two sides meet in the Scottish Cup last-16 in Dingwall, with County the only side to have claimed a victory from the three Championship meetings so far this season in a 2-1 triumph at Victoria Park in December. The other two matches ended in draws. Inverness boss John Robertson, along with several of his players, have been adamant they have deserved to win each game, however Ferguson insists the result is all that matters. Ferguson said: “We hear that, and we hear that if they’d turned six of their draws into wins they would be above us in the league. “We’ll not disagree with it – Inverness have played really well in the games. “We’ve not said we have played exceptionally well in the derbies, but we managed to win the last game. “Would we have liked to have played better? Of course. Did we think Caley Thistle played well? Of course. We have not said anything different to that. “We felt Inverness played better and Inverness have said they would rather have the three points than play better, so there’s a recognition from both clubs of how the derbies have gone. “If you’re asking me would I rather Caley Thistle dominated and we won, or us dominate and Caley Thistle win, I’d take us winning every time. Ferguson believes this season’s derbies have benefited from the fact both clubs are pushing for promotion back to the top-flight, and he added: “It is probably a little bit of a mindset thing. When both clubs were in the Premiership, certainly latterly, there wasn’t a feel-good factor or a bounce in the step coming off the back of a really good run. “We were always trying put something right or do something slightly different. “Both clubs have had relatively decent starts to this season and both have had moments in the season they can be really pleased with. “We have both gone periods of time having not lost games, scoring plenty of goals and accumulating points. I think that all helps the derby game. “Both teams have gone into them looking to continue good runs, striving for the latter stages of the Scottish Cup or, if it’s the league, looking to gain ground on teams above or below. “The standing of both clubs in the Championship makes it slightly different.